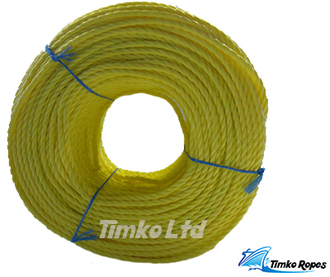 Coloured split film 3-strand twisted polypropylene rope sold in 220m bulk coils. 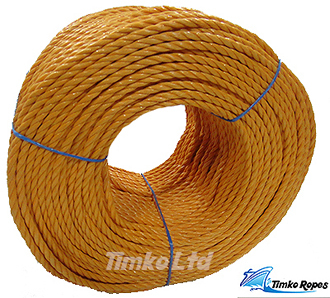 We sell this in 4mm, 6mm, 8mm, 10mm, 12mm, 14mm, 16mm, 18mm & 20mm diameter or Thickness. We supply these in orange, yellow, white, black & red. Also known generically as blue ‘nylon rope'. 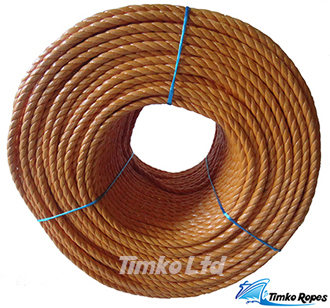 It is resilient to weather and rot proof and can be used for hundreds of uses including in the home, in the garden, draw cord rope for pulling cables underground, barrier ropes, securing off areas. You will find our polypropylene rope holding down tarpaulins on HGVs, lashing nets to scaffolding and securing loads and luggage up and down the country. Uk's leading supplier and manufacturer of polypropylene rope. 6mm orange polypropylene 3-strand twisted rope supplied in a 220m bulk coil. 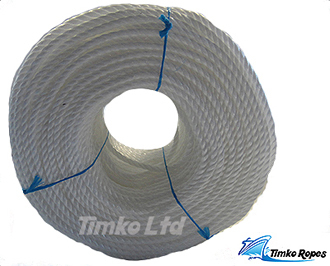 6mm white polypropylene 3-strand twisted rope supplied in a 220m bulk coil. 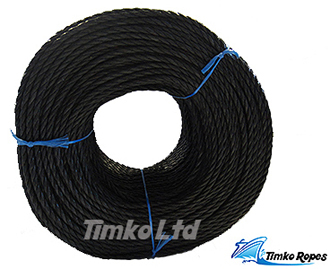 8mm black polypropylene 3-strand twisted rope supplied in a 220m bulk coil.